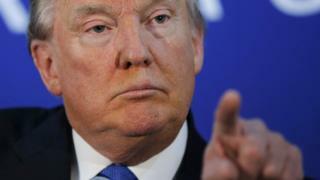 Republican presidential candidate Donald Trump has said he would be open to having a "Muslim database" in the US in the wake of the Paris attacks. Mr Trump said in an interview with Yahoo Politics that he would consider "drastic measures" for monitoring the community. Asked if that may include registering Muslims in a database or using special ID cards, he did not rule it out. Islamic State militants said they carried out the attacks in Paris. The suicide bombs and shootings at various venues across the French capital killed 129 people on Friday. "We're going to have to do things we never did before," said Mr Trump, a frontrunner in the Republican race for the White House. "And some people are going to be upset about it, but I think that now everybody is feeling security is going to rule." He told Yahoo Politics certain things would have to be done "that we never thought would happen in this country in terms of information and learning about the enemy". The US is going to have to do certain things that were "frankly unthinkable a year ago," said the billionaire businessman, who has previously said mosques should come under surveillance and Syrians should be deported. Dozens of state governors and Republican lawmakers have called for a halt to the processing of Syrian refugees into the US. One of the suicide bombers in Paris is thought to have entered Europe with refugees fleeing the Syrian civil war. Retired neurosurgeon Ben Carson, another leading contender in the Republican race for president, compared Syrian refugees to dogs while talking to reporters in Alabama on Tuesday. "If there's a rabid dog running around in your neighbourhood, you're probably not going to assume something good about that dog," Mr Carson said. "And you're probably going to put your children out of the way. That doesn't mean that you hate all dogs." A bill tightening the vetting restrictions is due to come before Congress on Thursday. This week, President Barack Obama criticised Republicans as hysterical and un-American for saying the US should not accept Muslim refugees.